We were invited to join a local club to fish the Orellana on a 36 hour social with a local Spanish fishing club. The club President, Chino a local predator angler that Craig has converted into a carp angler, organised the event to help the novice anglers in the club to fish for bigger carp than what they normally fish for in another lake. We didnt get much time to prepare for the first nights fishing, arriving at the bank with less than 2 hours before dark. Craig opted to use A-Tract's boilies for the session, wading out over 40 meters and sticking out a couple of kg towards a bay in the trees. Chino and the other members, many fishing beachcaster style on telescopic rods with bells for alarms, set up 100 meters to our left and baited heavily with maize. He was straight into fish, they mopped up his heavily baited area throughout the night. He had over a dozen fish to 24lb and eventually wound in his rods to get some shut eye. Like Craig he had been working hard all week and were tired when they started fishing. Craig had 6 fish on the 1st night, working hard as he was fishing around 150 meters, wading out each time he had to cast. 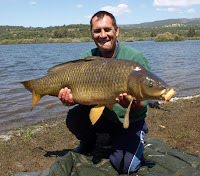 Philipe, on his first ever carp session on the Orellana arrived Saturday lunch time, he cast his rods and was soon into a fish. He did well fighting the lump considering the tackle he was using, the big common had managed to tangle with another line, which obviously didnt help matters. 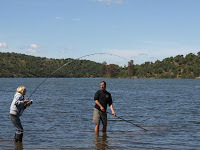 Craig ran over to help, wading in with a net whilst trying hard to explain how work the drag as he prepared to land the fish. Unfortunately the fish was eventually lost within yards of the net, Craig was gutted for Philipe, he got a good look at the fish and estimated it to be around 50 - 60lb. That was it, the novice anglers quickly accepted the fact you need propper tackle and decided to share Chinos spare pod and rods. Chino lost count of the runs he had, he also managed to loose a couple of lumps, they were just too powerful and managed to get into snags. Craig caught steadily throughout the day and was tiring, that so that he didnt fish the second night, so much for the relax and chillout weekend. During the 36 hour session, Craig managed 21 runs, six of these resulting in 30lb plus fish. Sarah, who has only had a couple of short sessions on Sierra Brava, fished 1 rod for 3 or 4 hours and had a couple of runs. The first fish she landed was a small common of 8lb, the second, a hard fighting new PB common. Craig had just landed a 29lb common as Sarahs rod screamed off, the fish was quickly placed in a sack and he rushed over to help her. Here he is giving instructions as she was hanging on as the fish makes yet another run for freedom. As we say, these fish fight all the way to the net. Sarah wearing a big smile with her new PB of 21lb and Craigs 29lb. We dont often get to nightfish, but this just shows what results can be achieved on a short session with no prebaiting, so roll on when night fishing becomes legal. We will keep you posted on the matter.